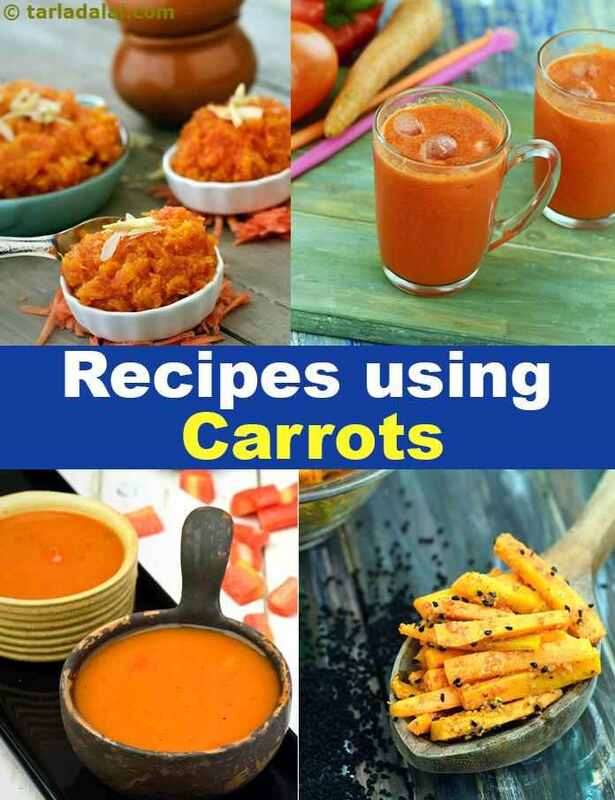 carrot recipes collection. indian gajar recipes. Carrot, or gajar, is one of the most versatile root vegetables you can find. It is mildly sweet in taste and found in different colors like orange, purple and yellow, but the most commonly found is the orange one. One is surprised as to how many different types of things can be made with carrots, ranging from sweets to juices, subzis and soups and much more. Below is a gist of a few of my favorite carrot recipes in every variation, hope you like it! A super soft pancake, with rice flour, coconut and the brightness of carrots makes the perfect Carrot Dosas either for an evening snack or breakfast. Finger food is preferred around the world for snacks as well and there many that can be made with carrots like the creamy Carrot and Cheese Toast and the mind blowing Baked Carrot and Spring Onion Open Toast, which is an amazing medley of flavors together. Something innovative that is cooked with carrot is Whole Wheat and Carrot Beetroot Savory Muffins. Don’t be confused by the word 'muffin', these are not sweet but instead are perked up with savory spices and make the perfect snack on the go. But if you're looking for something simple, look no further than Stuffed Cabbage Carrot and Cheese rolls, made with leftover rotis and simple veggies. There are so many varieties of healthy food that can be had in different ways, whether as juice or snack. Carrot, being rich in Vitamin A, is really important for us to incorporate in our diet. A few ways in which you can do that is first to make a juice like Carrot Beet and Apple Juice, a complete energy boosting drink. Another way to eat it is as a salad, a Cabbage, Carrot and Lettuce Salad. An offbeat healthy recipe would be Mini Carrot and Cabbage Buckwheat Pancake, which not only gives you the goodness of carrots but also of buckwheat. Due to the bright orange color and the mild sweetness, carrot soups become appealing to the eye and to the palate. There are a lot of options to pick from like the simple, yet wholesome Cream of Carrot soup to the more complex and rich Carrot and Moong Dal Soup. Carrot is a lovely ingredient that mixes well with a lot of other ingredients to produce impeccable dishes. One of such examples is Rice and Carrot Soup which is a unique combination of a cooked rice and sautéed carrots combined together and had as a meal. The most basic way that uses carrot in Indian cuisine is by making Carrot Paratha. By simply adding grated vegetables to the atta, you can create so many types of parathas, carrot paratha being one of them. Another way to do it is to stuff the dough to get thick, scrumptious parathas like the Green pea and Carrot Paratha. A lot of Indians make bhakri as well, which is a thick pancake make of rice flour. This simple recipe can be jazzed up with vegetables, for example the Cabbage and Carrot Rice Bhakri, and be given a lovely twist. Carrots are added to subzis to give them a hint of sweetness. In the Carrot and Methi subzi, carrots perfectly balance the bitterness of the methi with its sweetness. It works well in Broccoli, carrot and Paneer subzi too as all three have different textures and flavors that complement each other very well. Carrots are also added to rice dishes like pulao, and Carrot and Cucumber Curd Rice to enhance the overall taste. Who can mention carrot desserts without first taking the name of Gajar Halwa!! This is the most delectable Indian sweet out there, everyone's favorite. Here the grated carrots are cooked in milk, ghee and sugar to make to most creamy halwa. Carrots also make a great addition to a kheer like dessert called Carrot and Cashew Payassam. Being sweet in taste, simple desserts like Chocolate, Carrot Brownies can also be made with carrots which also provide some earthiness to the taste. Enjoy our collection of 1900 Carrot Recipes. Carrots and coriander in this yummy soup fulfill up to three fourth of your daily vitamin a requirement. While keeping the calorie count down to only 36 calories this soup wins the ultimate soup for weight watchers award!